Interesting fact: on a uniform swing, that would mean Labour would be just 2 seats of an overall majority. Are those 95% confidence intervals? I’d take even money for each party that their final vote is outside the range indicated. I like the bottom up data approach – but it is also worth looking top down. The 70 year trend for the two main party combined share of the vote has consistently been down. The only difference in the 2015 election is that we now have an incumbent third party which might help the two party share of the vote (this effect may be annulled though by UKIP). It is a fair assumption that 88% of Total UK vote will go to the two main parties plus Liberal Democrat and UKIP. No incumbent has increased its share of vote since 1974 (and that was a six month Government not a five year). Labour is now the natural party of government scoring 40% share as recently as 2001 (after the Iraq War and credit collapse their share fell to 29% in 2010). If we assume there is no increase in the two party vote: 66% there is 22% available to Liberal Democrats and UKIP. A good guess would be UKIP 10%, Liberal Democrats 12%. The 2015 election is different, because there are two incumbent parties, but I think it is inconceivable that the two main parties will increase their combined share of the vote by more than 3% (all polling indicates significant numbers of voters unimpressed with the two main parties). 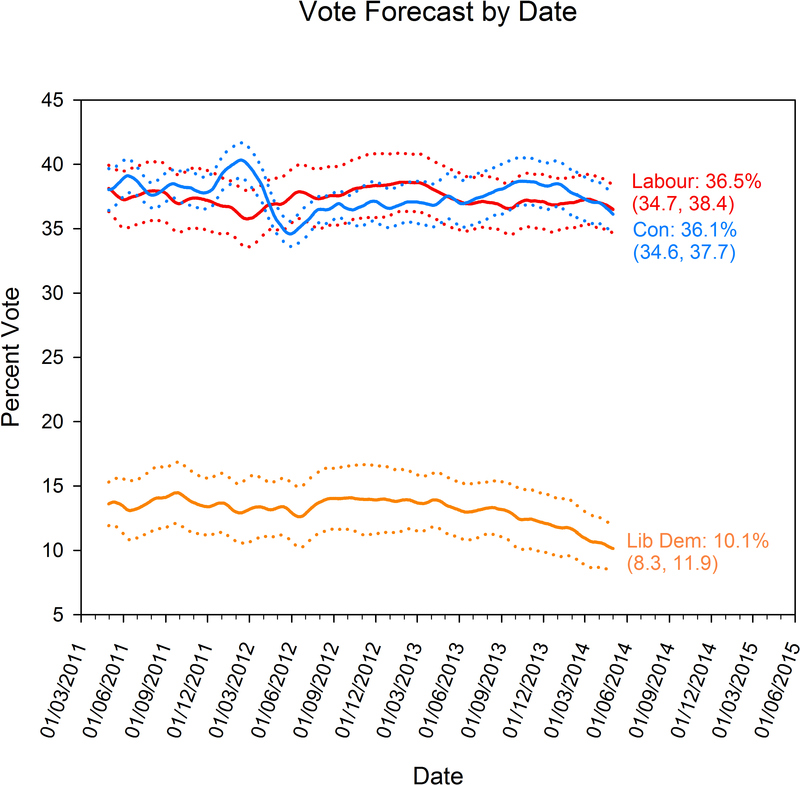 Labour will recover votes lost in 2010 if only because of fall in Liberal Democrat share. This makes it very difficult for the Conservatives. The best scenario is Conservatives getting 35% and Labour 34% a net gain for the two main parties of 3% (leaving 19% for the 3rd/4th parties). Where this 19% goes is the interesting issue and how it will translate into Seats. Liberal Democrats highest share would be 14% with UKIP getting 5%. On universal swings this would result in +16 gains Tory and +12 Labour but tactical voting will mitigate Liberal losses to max 15 seats (25% total) and may elect maximum 2 UKIP seats. If this scenario is right, and it seems reasonable, there are only approximately 13 seats available as net gains for the two main parties combined. Let’s assume the Liberals hold 42 seats and lose 15. Based on the most marginal seats 8 of these would go to the Conservatives and 7 to Labour. A wipeout for the Liberals would only benefit the Conservatives over Labour by a few extra seats which means that the main battle is between the two main parties. This is where it gets problematic for the Conservatives: they will need to hold seats against an inevitable increase in Labour vote. The best scenario is them losing 39 seats to Labour (using ElectoralCalculus.co.uk) with a gain of 8 from the Liberals this would still leave them with a net loss of 31 seats leaving Labour as the main (if not majority party). The top down approach points to only two possible outcomes: Labour as largest party (with majority) or Labour as largest party (without). A bottom up approach may suggest there is a third possible outcome but this flies in the face of political reality. Francis Maude is having a terrible time from some of his core supporters because of the possibility of fracking in his Horsham constituency. I think there are another 35 or so Tory MPs similarly affected by the problem. Has anyone done any analysis on how fracking might impact the GE result? Ditto for the Heathrow matter. What are the error bands meant to be? 50% confidence intervals perhaps? There is no way that any prediction of votes at the GE can have 90% confidence intervals of less than +/-5% at this stage.